I can't seem to make heads or tails of this language, or how it works. I've tried multiple tutorials, and none of them seem to apply anymore, as well as the documentation doesn't make any sense. Could someone help me out on simply getting my NPCs to talk? That script doesn't look like it should fail to work but is visibly off-standard for modern setups, and might have some oddities causing it to fail. If you can't figure it out, post some error logs or similar here or on Discord for help figuring out what went wrong. Yes, those videos are the ones I've been looking through. Even if I copy the script in the video verbatim (which each set of videos does it slightly differently of course), it doesn't seem to work - it's not erroring as far as I can tell, it just doesn't do anything. Did I miss a step where I had to activate a permission or something? 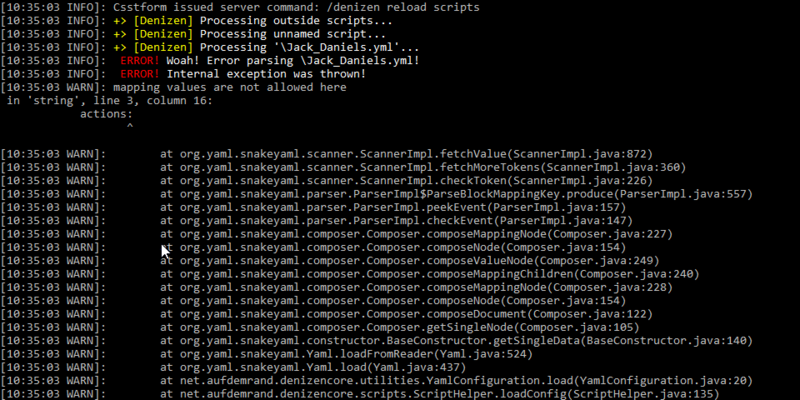 Basically anything you try to do in Denizen will either give very explicit and useful debug output (until you disable debug for the relevant section) or an error. If you got neither of them... you're missing multiple steps that you need to do. I see now... it shows when I reload the scripts, whoops. It's throwing an error when I declare the interact scripts. the interact scripts block should not be tabbed out further than the type. Can probably apply the same fix to whatever your current script is. Thanks, that got it working.